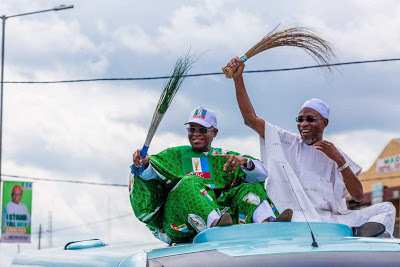 As would be expected, the two leading parties in Saturday’s Osun State governorship election were yesterday locked in a war of words over the stalemated exercise. The APC said it was providential that the election was declared inconclusive by INEC, claiming that PDP's victory would have been a calamity for the people. But the rival Peoples Democratic Party (PDP) said it was robbed of victory, calling on INEC to rise above partisanship and declare its candidate winner. INEC yesterday fixed Thursday for a rerun election. The elections are to be conducted in seven polling units within four local government areas of the state. The electoral umpire nullified the ballot from the affected units due to irregularities and over voting. INEC’s election guideline made pursuant to Section 153 of the Electoral Act stipulates a rerun if the margin of victory in an election is lower than the number of voters in units where elections are cancelled. In all, 3,498 votes were cancelled, making it impossible for the commission to declare any party the winner on the first ballot. At the INEC State Headquarters in Osogbo, the state capital, Returning Officer (RO) Prof Joseph Adeola Fuwape yesterday listed the affected local governments as Orolu, Osogbo, Ife South and Ife North. He noted that the cancelled 3,498 votes could swing victory in favour of either the PDP candidate, Senator Ademola Adeleke, who polled 254,698 or his APC counterpart, Gboyega Oyetola, who was trailing him on the first ballot with 254,345. According to the RO, the 353 votes difference between Adeleke and Oyetola is not enough to declare anyone the winner. He said the result from Osogbo Unit 017, where 884 voters were registered, was cancelled because the presiding officer absconded with electoral materials. In Orolu, the election was cancelled due to ballot box snatching. The Osun State Resident Electoral Commissioner (REC), Segun Agbaje, said the rerun would be between 8am and 2pm. Agbaje said that since the affected polling units are few, voting will end early so that the winner can be announced as promptly as possible. “It was the limit that corrupt money could go to buy up an election,” the party said. ‘Now that Osun has been given a second chance to escape from the calamity it almost fell into, the people of Osogbo, Orolu, Ife South and Ife North have the enormous task to save the state from predator-politicians,” the statement, signed by Kunle Oyatomi, the Director of Publicity, Research and Strategy, said. But the PDP insisted that the process was conclusive and that its candidate was in clear lead and should be immediately declared winner, having met the requirements of the 1999 Constitution (as amended).